For many, Georgia is still an undiscovered destination. Located right at the crossroad of Europe and Asia, the country is neither Eastern nor Western. It’s the combination of both! 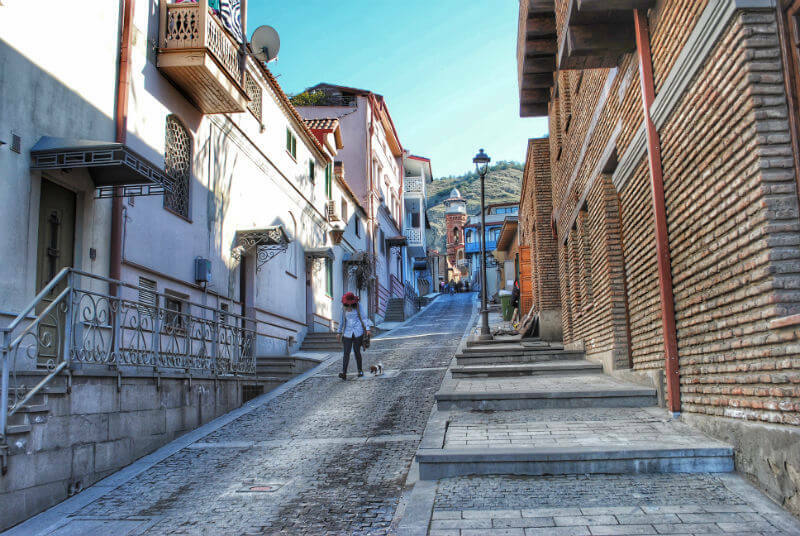 The capital, Tbilisi, reflects its complicated history in its architecture and narrow cobblestone streets. Here, you see a perfect blend of old and new, modern and ancient as well as the impact of Persian and Russian rule of many decades. Today, Tbilisi tends to have a contemporary lifestyle, something similar to European cities, but still, portrays old traditions and culture tied deep in its history. This small country gets the attention of many travelers who love adventure, hiking, lush nature, skiing, wine, unique cuisine, underdeveloped villages or warm, hospitable people. Georgia has always been a budget-friendly destination compared to its many Eastern European or Middle Eastern countries. Thus, the decline of Georgian Lari against stronger currencies makes it even cheaper for digital nomads. Besides, affordable cost of living, Tbilisi has many benefits and advantages for digital nomads. 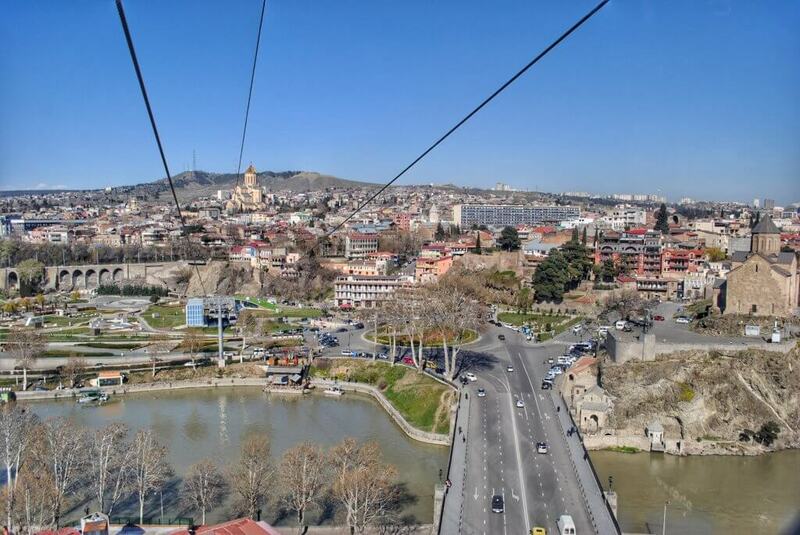 Read on to know why Tbilisi should be your next destination. In 2014 Georgia adopted a new law of on Legal Status of Alien and Stateless Persons, according to which the maximum allowed staying period for a foreigner is 90 days within a 180-day period. However, Government of Georgia has determined a separate ordinance allowing citizens of particular countries to enter Georgia visa-free for a year! National of all EU countries, the U.S. and British Overseas Territories can benefit from this along with some Balkan states, Latin American, Asian and Middle Eastern countries. As mentioned above, living in Georgia is relatively cheap. Tbilisi has some budget-friendly accommodation options available on Airbnb and Booking.com starting from $28 per night for the entire apartment. But if you plan on staying long, the best way would be to rent a flat. Compared to other countries, staying in the city center might still be cheap. Thus, if you want to save money, experience local lifestyle and transportation, you can rent a flat outside the center. The price for an entire apartment starts from $200 depending on the district and can go up to even $1000 if not more. Such pricey accommodation is usually a house in the suburbs. The rent price is often quoted in USD, and you’ll be asked to pay in dollars. You can find owners who charge in Lari, but it’s relatively rare. The devaluation of Lari has raised the price of groceries for a bit. So did the price of alcohol and petrol. The price for groceries also depend on the district you’ll live in. The cheapest option is to go to local markets where you can still find locally produced fresh vegetables and fruits. Some may consider dining out inexpensive too. However, the cost of a meal does depend on the venue and how often you’ll eat out. Tbilisi hides some cheap pubs to eat traditional, European or Asian cuisine. Typically per meal will cost you around $11 including a beverage and maybe two types of traditional meal. Transportation here is a bit complicated than in any other European countries. There are mini buses or marshrutka as locals call it, buses, subway, and taxi. While buses operate, as usual, the system of marshrutka might be quite complicated for many. If you want to get in marshrutka, you have to wave as you would for a taxi whenever you are standing. When you want to hop off, it can stop whenever you desire. The only exception of this is two main avenues of the capital – Rustaveli and Chavchavadze. Bus and subway ticket costs 18 cents while marshrutka costs 29. There also is a Metro Money card which has its benefits. For instance, when you pay with the card in marshrutka for the second time during a day, the price reduces to 24 cents. While you can travel for free for 90 minutes after you purchased bus or subway ticket. Note that without the card, you can’t enter the tube, but you can pay in cash in marshrutka and at the bus. To avoid any headache and remembering all those rules, the easier way is always to use the card. And you can easily top it off at any bus stop using orange color self-service machines. The whole concept of coworking spaces is new here. There are only two – Impact Hub and Vere Loft offering monthly membership in various price range. However, 99% of the cafes and restaurants are Laptop Friendly and have a good internet connection most of the time. Tbilisi boasts with coffee shops where you can have a good coffee and enjoy a delicious pastry. Some of my favorites to work from are Entree, Prospero’s Books, and New Mziuri. Additionally, the city has a free WiFi hotspot called Tbilisi Loves You. But don’t rely on it for work purposes. The availability of it is limited to certain areas of the city. It’s mostly available in the center and touristy places, and the connection might be weak. However, you can use it to search a particular location on Google Maps, post a photo on Instagram or check your email on the go. Georgian meals have an influence of Middle Eastern cuisine and its heavy on the dough, meat, cheese, and walnuts. Each region has its traditional meal making Georgian cuisine very diverse and authentic. Vegetarians can find something for their taste as well. Feast is an important custom here which requires a whole new post. Supra, local way of dining, includes dozens of different meals placed in the center of the table while people sit around it and share the meal. Wine and toasts are an integral part of supra. And if you happen to visit Georgia family, make sure to come hungry and drink as much wine as you can. There is a saying that a guest is a gift from God and it’s not just a saying for locals, it’s the way they consider their guest. Hence, comes the incredibly warm hospitality traditions Georgians are famous for among that small portion of travelers. The staple of Georgian cuisine and the favorite for many locals and visitors are Khinkali – a meat dumpling. 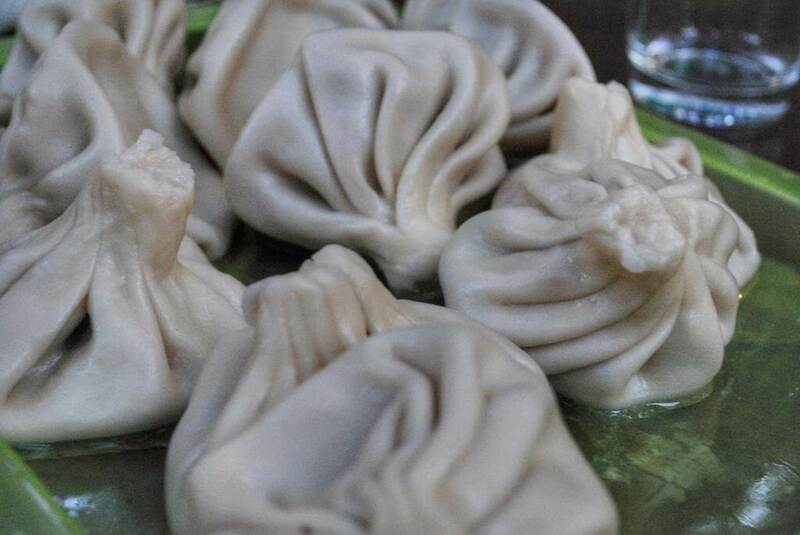 Compared to other dumplings you might have tried, Khinkali is boiled in water, which helps to produce juice inside the dough. The right way of eating Khinkali is not to spill the broth on your plate. It surely needs practice. Another must try meals are vegetables in walnut sauce. Spinach, cabbage, eggplant and bell peppers seasoned or stuffed with walnut paste. Every traditional supra has it. At a local family, you’ll see them served separately, but many restaurants offer the mixture of all in one serving. 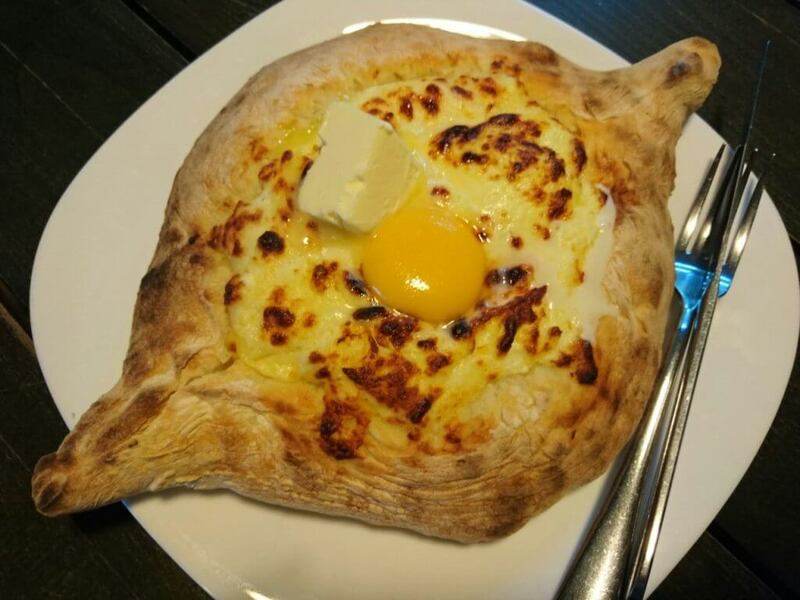 A pizza-like meal called Khachapuri is stuffed with mozzarella-like cheese baked in the oven. It’s the third most common meal. Each region has its own variation of Khachapuri, but a unique one is from Adjara, the seaside of Georgia. A boat-shaped dough is baked in a brick oven together with cheese. Once it’s done, the chef cracks a raw egg on top and adds a knob of butter. To eat, mix everything and dip bread in the mixture. Georgia is one of those few countries where you can experience everything due to its diverse climate. Here you can ski in summer morning and dip in the sea in the afternoon, explore the desert, enjoy the view over the canyon and visit ancient cave towns to name a few. If you are a real explorer, Georgia is the place for you. 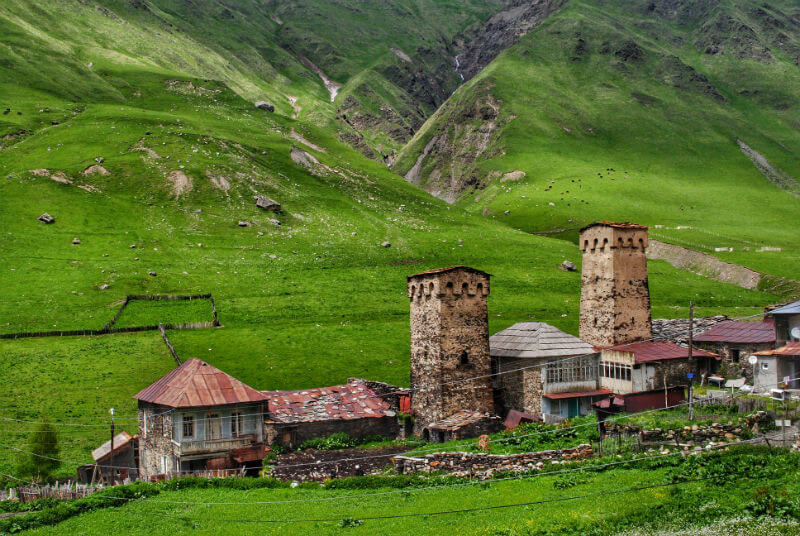 Also, there are excellent tracking and hiking opportunities for outdoor lovers, while to would like to explore more authentic villages can head to mountain regions of Tusheti and Svaneti, where each family has its own defense tower. Moreover, one of the villages of Svaneti is considered to have the highest altitude settlement in Europe. Besides, traveling across the country, you can also visit to neighboring countries of Armenia, Azerbaijan, Turkey, Iran, and Russia. Borders of Armenia and Azerbaijan is very close to Tbilisi, and you can hop on a mini bus or a train for more authentic adventure. Since Wizzair started operating in Georgia, it’s been easy to travel to various destinations from Kutaisi, the second largest and former capital city of Georgia. At last but not least reason for you to come to Georgia is its wine culture and traditions. The country is believed to be one of the oldest regions in wine making in the world. Wine production here dates at least 8,000 years. Traditional Georgian wine is made in Kvevri, a clay jar, and is buried underground. The whole fermentation process takes place there. This method of winemaking is even enlisted in UNESCO Intangible Cultural Heritage List. Among post-Soviet countries, Georgia remains the second in grape production after Moldova. Today, there are many different companies producing all types of wine. There are large wineries as well as small farmers, called family wineries, who use both European and traditional winemaking techniques. For better wine tasting, head to wine bars where the experienced staff will advise which one to try depending on your taste. And once you get the hang of it, visit wineries for a more authentic experience. After all, it’s always nice to enjoy a glass of good wine after your hard work at the computer all day. 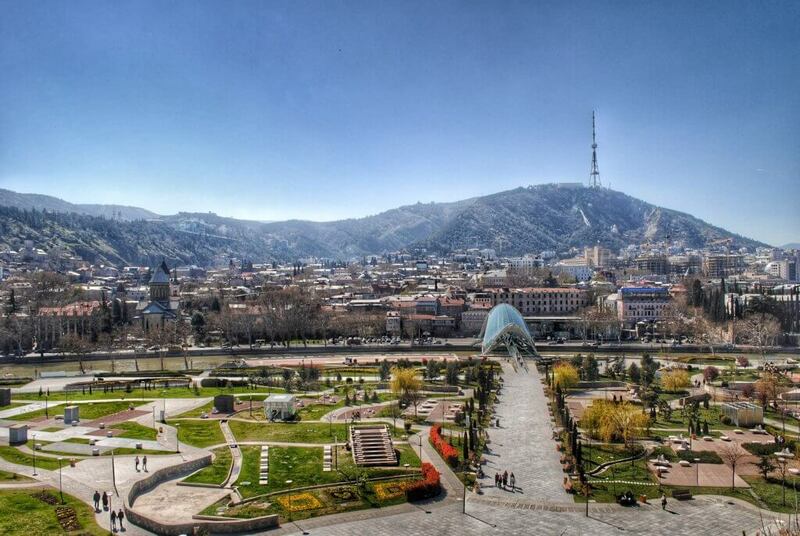 There are dozens of more reasons why you should visit Tbilisi and make it a base for a while. But these six reasons are the most important ones to make you think about relocation. Want to know more Laptop Friendly places in Tbilisi? Click here. I am Baia – a content writer, travel junkie, food lover and a passionate photographer. My love to travel and experiencing new cultures, traditions and customs made me realize that I want to make traveling a big part of my life. So in October 2014, I decided to pursue my dream and spend #213DaysInAsia, starting from Nepal and moving to South East Asia with a very close friend of mine-Mariam.